How pretty is this magnet? 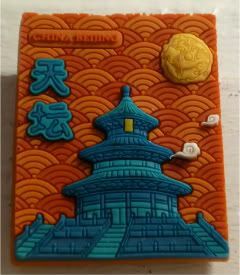 It's from my roadtrip buddies who went to Beijing a few years ago. Reminds me of two things that have surprised the heck out of me in the last couple of weeks, hence the blogtitle mash up. First. The Karate Kid remake last year was not that bad. No, hear me out. I grew up with the Ralph Macchio/Pat Morita version and I was pretty adamant that I'd never watch the movie. But when Starz says, here's a free preview, you watch. And I was completely surprised by how entertaining it was. It was set in Beijing, where the little Jaden Smith and his mother move out there from Detroit. It was clarified pretty early on that he was practicing Kung Fu and not Karate, in fact, the reverence the kid had for the incredible sweeping shots of a Kung Fu-practicing nation was touching. Jackie Chan was of course, terrific. Even if it was a major role, it was pretty understated, and not how I'm used to seeing him. The bully angle was timely, giving the kids being bullied today something to believe in. And the bad guys were totally believable. Mean, but believable. And the locations were just astounding. Whether it was Olympic Park, Forbidden City, aerials of the Great Wall, or even hundreds of people dressed in uniforms, it was just gorgeous. My only issue was that I didn't buy a Detroit car company sending an employee to Beijing, especially when they didn't even define what sort of function she fills. Marketing? Operations? Didn't seem like a high-level position, so why send her over? And then there was the lone American kid that the little boy almost makes friends with totally disappears within the first 15 minutes. But whatever. Good movie...even as I winced every time Jaden got hit. My other happy surprise is @ShawnRyanTV's The Chicago Code. I freakin' love this show. I kinda knew I might because Shawn Ryan's written so many other great shows, but TCC is the one show that I literally stalk Hulu for when the next episode becomes available. I Hulu'd the latest one a few days ago - Chinatown mischief, where of course the unofficial mayor of Chinatown (played by LOST's Dr. Chang) is protecting his constituents, covering for a couple of murderers, only so he can deal justice himself. Normally, I really do not enjoy cop dramas. But, I think I'll watch anything that has bulletproofvesttime great characters to get to know, with complicated relationships or personal situations to deal with. I tend not to care about the Crime of the Week, and instead get invested in the characters and long-term story arcs. This one has several layers of both. With each passing week, I'm surprised that I'm starting to buy Jennifer Beal as CPD's superintendent, trying to figure out if I'm supposed to like or revile the ever-awesome Delroy Lindo as Alderman Gibbons, and loving Aussie Jason Clarke and his cuteboy partner Matt Lauria from Friday Night Lights. Plus? I love hearing the Chicagoland accents, fake as they are. They're the accents I would have had, if we hadn't moved from Chicago when I was five. Definitely check it out. The Chicago Code. Not the accents. Well, them, too.